Congratulations!! Many of you likely just found out you were pregnant. And the first thing you want to know is "When is my baby due?" 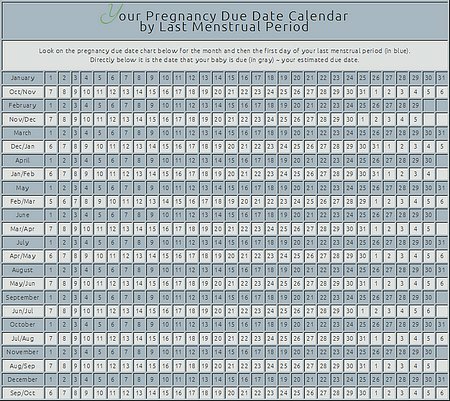 You'll find the pregnancy due date calendar below very helpful for figuring your estimated due date. I also have a baby due date by conception date calendar for you ladies that know when you conceived. If you don't know the date of conception, that's OK. You just need to know the date of your last menstrual period (LMP). Know the day of your LMP? Great! To determine pregnancy due date, click on the link below and find that date on the calendar (in blue). Then directly below that you will see your estimated due date (in gray). Easy. Look on the pregnancy due date chart below for the month and then the first day of your last menstrual period (in blue). Directly below it is the date that your baby is due (in gray) ~ your estimated due date. Know when you conceived? Great! 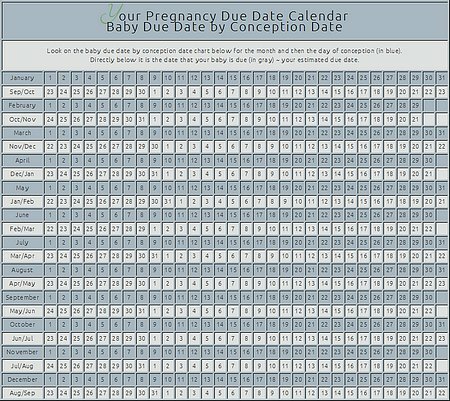 To figure pregnancy due date, click the link below and find that date on the calendar (in blue). Then directly below that you will see your expected date of delivery (in gray). Easy. Look on the baby due date by conception date chart below for the month and then the day of conception (in blue). Now that you know your estimated due date, go to the Pregnancy Chart for help in determining which week you are in. My pregnancy chart will show you exactly how this site calculates the stages of pregnancy so there is no confusion. Then look to the navigation buttons on the left and click on your current week's pregnancy stage and continue week by week. So again, congratulations!! And happy and healthy nine months (40 weeks)! !